Michele Strobel shared an article she had just written for the Christian Community News which serves Central Washington. It was an article that testified how 24/7 prayer in their community targeting among other things CRIME reduced it by 50% in 2 years. They are setting an EXCELLENT example of what it takes to occupy the Mountain of the Lord's House of Prayer for All Nations (Isa. 2:2, Mic. 4:1-2, and Isa. 56:7) in a city and a region. This was very exciting to me for the leader who spearheaded this (Linda Iasella) worked with us in 2006 and 2007 and used ORT to mobilize the 24/7 prayer connecting National Day of Prayer with Global Day of Prayer. 2007 was the year that we reached 24/7/365 prayer in Washington State. 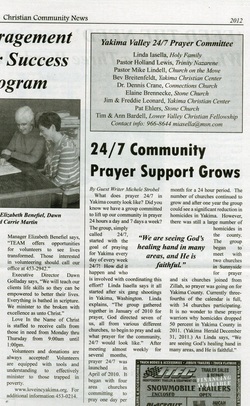 We had at least one church praying 24/7 each day of the year. In January 2008 the FBI reported how crime in every major city in this state declined. (complete testimony recorded in Operation Rolling Thunder the revised edition.) Seattle reached a 38 year low while I saw a quote from the Yakima Police Chief stating crime was at decades year low and he was unsure why. Linda Isaella and the praying churches in Yakima knew why. They had participated in the 24/7 prayer strategy that ORT introduced. Linda had another ministry that had assisted her with coordinating the 24/7 portion while she focused on the overall mobilization. They not only made an impact in their city and region but also in our state. Pastor Troy Green pastors Northwest Life Center in Grays Harbor County Washington reported how crime stats had continually declined over two years following the rise of 24/7 prayer. He led his county in Operation Rolling Thunder in 2007 when we established 24/7 over Washington and then in Jan 2008 the FBI reported that crime went down in every major city in our state. After Seattle and King county reached a 40 year crime low many churches ceased participating in the ORT 24/7 prayer strategy. The crime rate increased again. In 2009 CONECTer Donna Lippoldt from Kansas,reported that the police chief in Topeka hoped for a 3% drop in property crime but in the first month of ORT saw a 15.4% decrease. Linda responded, took the leadership role and began to mobilize 24/7 using the pattern introduced through Operation Rolling Thunder. Two years later we see this marvelous report of how the Church in the greater Yakima area (34 congregations) are working together to lift up 24/7. The results are measurable, reproducible and glorify our Lord Jesus Christ to whom all the glory and honor belong. I so appreciate leaders who serve as a catalyst but the truth is, it took the body of Christ in the greater Yakimar area working together long term to effect this transformation. That my friends is the kind of discipline that love inspires and wisdom utilizes. Jesus told us to occupy till He comes. They have set an excellent example of what occupying looks like. It is a spiritual war but a spiritual war in which we gain victories which bless and serve our communities. Since 2007 I have received 13 different reports from Churches who used ORT (click here) to mobilize their community report how crime statistics have followed the rise and fall of 24/7 in their community.